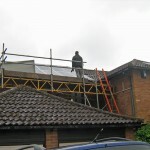 I previously described the installation and setup of the solar system on the back (south facing) roof of our house. 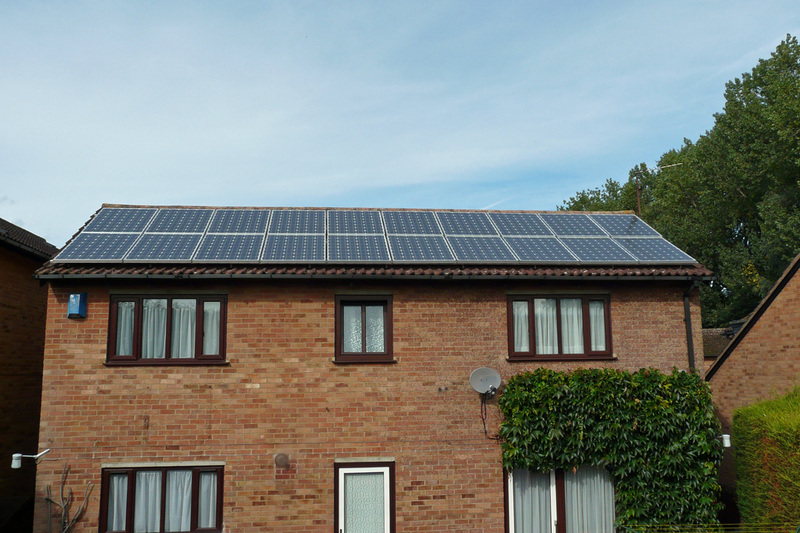 It was installed by Greenday Renewables who I highly recommend – we have had no trouble with it and it works very well. The most important information, however, is of course how successful it has been at generating electricity. The system is a 3.7 kWp array, consisting of 10 panels each of 185 Wp (plus an inverter in the loft), where Wp indicates ‘Watts peak’. 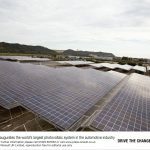 What this means is that in an ideal (‘peak’) situation the 185 Wp panels could each produce 185 Watts of electrical power, so all ten together could generate 3.7 kilowatts. Of course, they are never used in perfect conditions so an estimate is generally provided of the likely total amount of power generated for a particular system arranged at a given angle, direction and latitude. For our system this was 3333 kWh per year, where 1 kWh of energy is a kilowatt of power provided for one hour. The size of the system was determined by the roof space – it was the largest system that could fit. 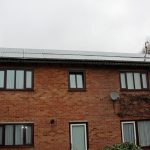 It is eligible for the government feed in tariff (FIT) which applies to any domestic system up to 4 kWp. We would have gone for the full 4 kWp if there had been the space. The system was installed in September 2010 so we now have two full calendar years of data on electricity generation, covering 2011 and 2012. Up until the start of 2012 I recorded the meter reading virtually every day but since then I’ve been doing it once per week. The data is recorded manually and then transcribed into an Excel spread sheet (soon I hope to replace that process with an automated system, but more of that in a later post). From the spread sheet I have been able to graphically chart the data – see below (and click to enlarge). Considered in broad terms the chart shows pretty much what you would expect – low generation in the early part of each year, building up through the summer and dropping again as winter returns. However, looking in more detail it is perhaps surprising just how much the rate of generation varies week by week as well as year by year. 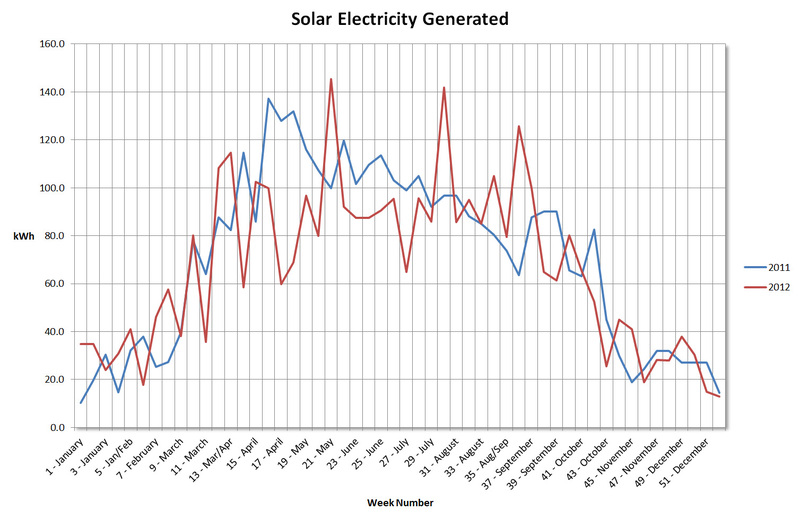 It is possible for one week to generate twice as much energy as another week in the same month. Similarly each year can have very different weather, so for example 2011 had generation peaks in April and May, while 2012 had peaks in May, August and September. In fact 2012 was significantly more variable than 2011. Fortunately over a whole year the peaks and troughs average out pretty well, and the system has performed well. 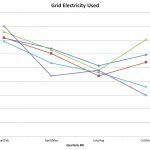 It generated 3650 kWh (3.65 megawatt hours) in 2011 and 3500 kWh (3.5 MWh) in 2012, and these numbers compare very favourably with the 3333 kWh that was predicted. Over these two years it was eligible for FIT payments of £3130 which is about one-fifth of its installation cost (£15750) so it is on course to pay for itself in about 10 years without even counting the cost of the electricity saved. After it’s paid off the benefits don’t stop, of course – it is eligible to get FIT payments for a further 15 years – index linked – and after that we will have free electricity for life. Overall it has been a great investment, so much so that we are looking to add another system on the front of the house with a view to using it to power our ZOE – more to follow on that in a future post. This topic contains 7 replies, has 5 voices, and was last updated by Trevor Larkum 4 years, 6 months ago. Big day tomorrow – getting second solar system installed, weather permitting, this time on the front of the house (north facing). If anybody hear has any questions on Solar or indeed any renewable I can advise on incentives available both Feed In Tariff and Renewable Heat Incentive.If you have any technical queries please feel free to ask and I will endeavour to help. 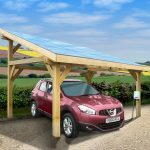 I’ve recently agreed to have the following PV setup. can you advise if this is “value for money”? single inverter. Owl monitor + owl heating + hot water controller (iboost) + voltage optimiser + all paperwork (building regs, EPC, etc.) for a grand total of £7K. For some time now I’ve been plucking up courage (mainly) to have my circa 1928 concrete tiles replaced with felt and new tiles and have subsequently decided now is the time to do it and take advantage of having the main south roof fitted with integrated panels. 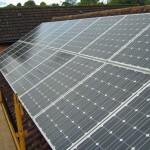 I’m getting solar quotes at the moment, but any advice on types of panels, inverters etc would be welcomed. For example, is it practical to try to achieve the capacity to charge our Zoe during the daytime, weather permitting? mydogisdead – glad you like the blog. I’d like to know more about your experiences – and if you want to write it up, we could post it on the main site.